During a recent trip to Mexico, a hurricane that slammed the coast of Oaxaca a week before rearranged the sand banks at a remote point. 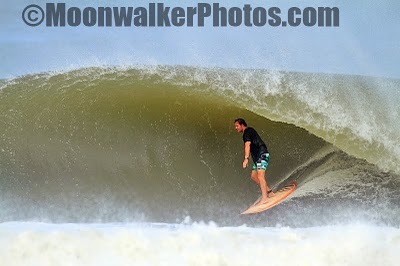 I took a two-mile march up the coast, noticed a new post-hurricane wave spinning down the beach and paddled out. Out in the lineup a set came. 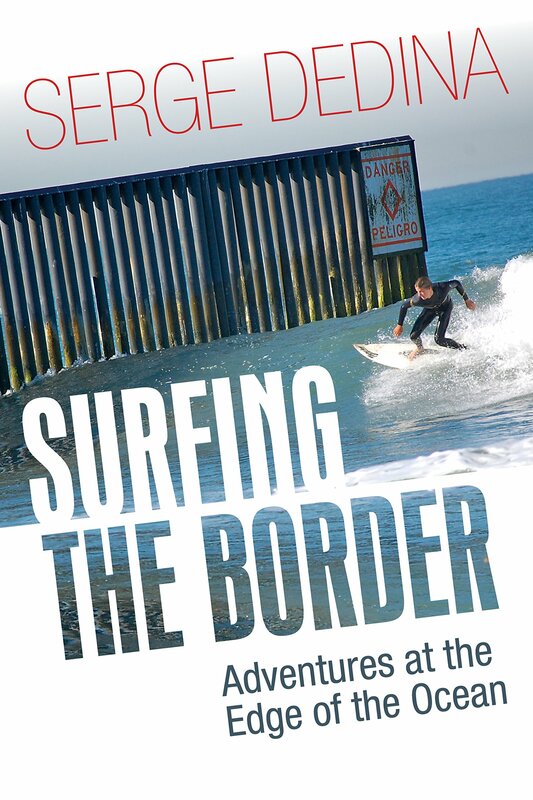 I caught the first wave and drove down a head-high wall that kept slightly open as it peeled along a narrow sandbar. For me the essence of living a stoked life is being able to see and try new experiences and tap into the energy of the ocean. I met my wife Emily in 1985 on my first day as a UCSD study abroad student in Lima, Peru. Emily, who is from Wisconsin, had just turned 20. I was 21. We immediately realized we shared a passion for adventure, the outdoors and the ability to laugh at our misfortunes. Soon we were clambering up rocks to reach 16,000-ft. alpine lakes in the Andes and exploring the culturally rich coast of northern Brazil. A few years after our marriage in 1989, we found ourselves living in a 14-foot trailer in an off-the-grid fishing village in Baja with our Australian Shepherd Chip while we carried out graduate research on gray whales. 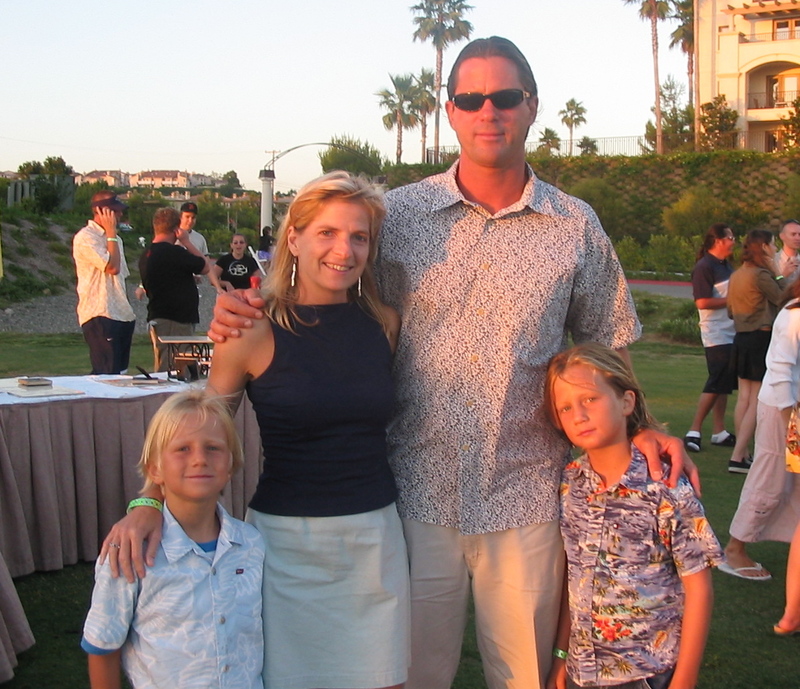 At the end of our two-year stay in Baja, Emily became pregnant with our oldest son Israel and we moved back to the U.S. Three years later my youngest son Daniel was born. That is when life got really good. 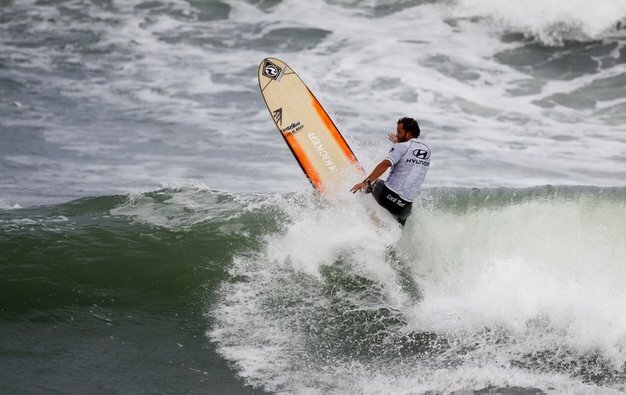 Before my children were born I was pretty much over the marginal conditions of the beach break I grew up surfing. As soon as my two sons were old enough to enjoy the beach, all of a sudden the mundane became exceptional. A normal day at the beach became the best day ever. With kids you get to experience everything new again and again. Their laughter as they jump over waves holding my hand and their joy the first time they surf a real wave. A few years ago, the boys and I hiked down to Black’s Beach on one of the best days of the winter. 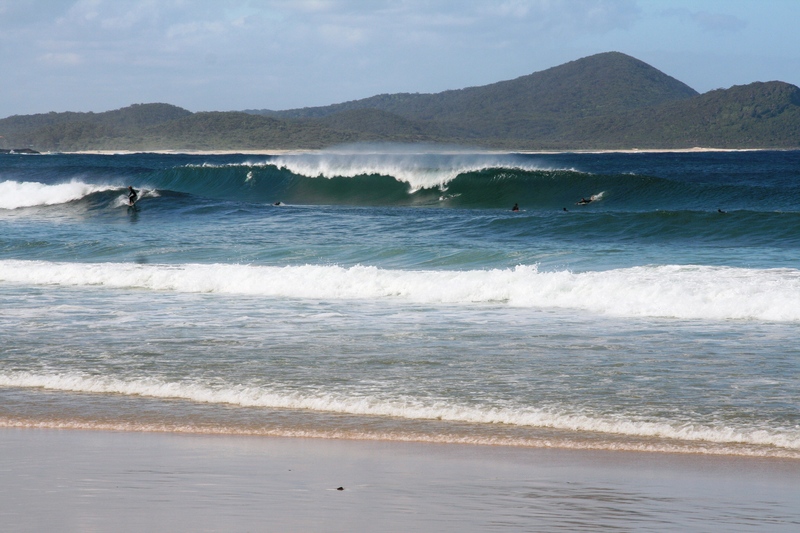 Normally I would have avoided the super-packed lineup of one of the world’s best beach breaks like the plague. 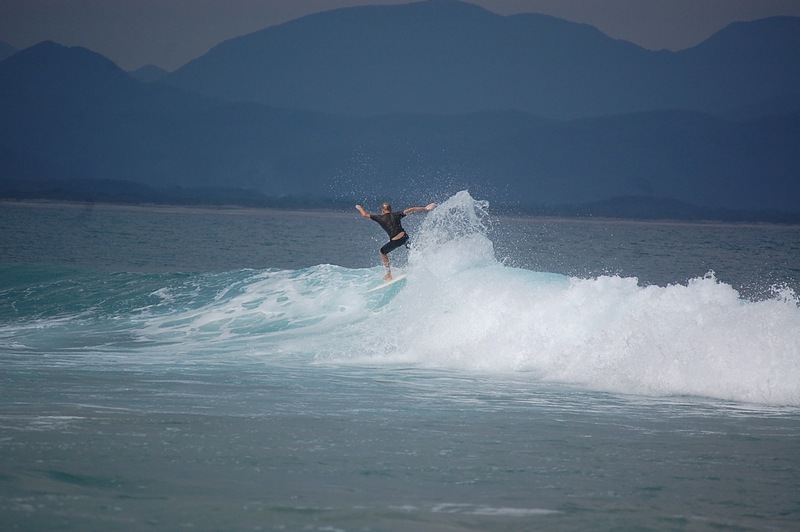 But whereas I was frustrated trying to compete with the likes of Jordy Smith for set waves, the boys were stoked to share waves with one of their heroes. 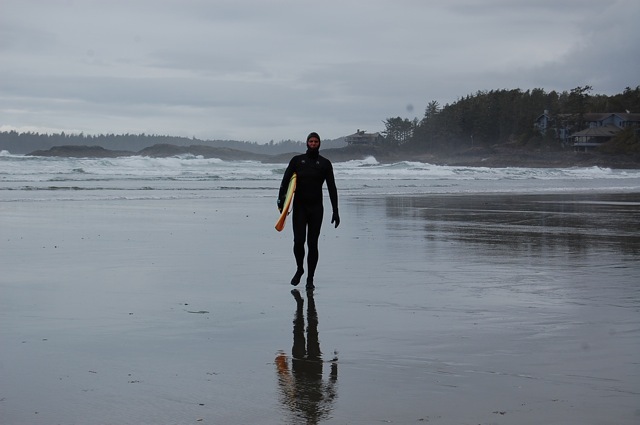 After a few waves I went in and found surf photographer Jeff Divine on the beach. “You know, with kids, everything is an adventure,” he said. 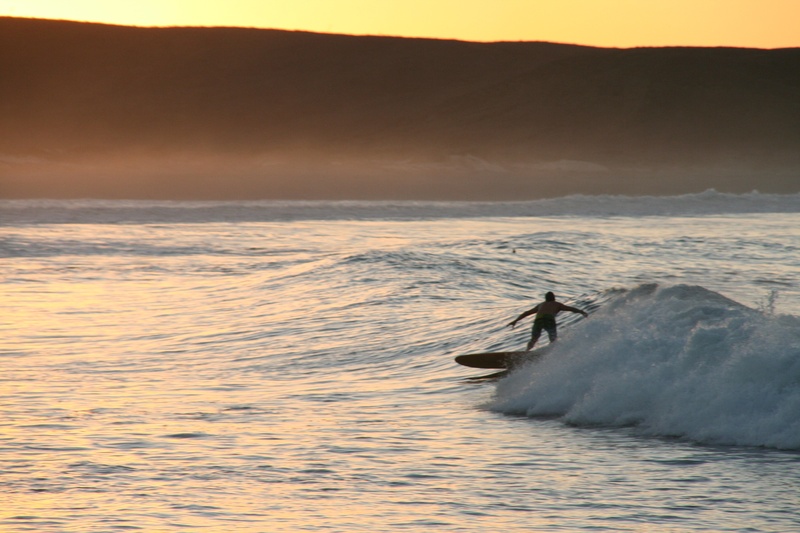 Six months after that experience at Black’s, Emily was kind enough to let me take the boys to Australia for six weeks to live in a van while we chased cold and powerful winter surf along the New South Wales and Victoria coasts. Emily came over and spent an additional month with us, which included a trip to New Zealand. 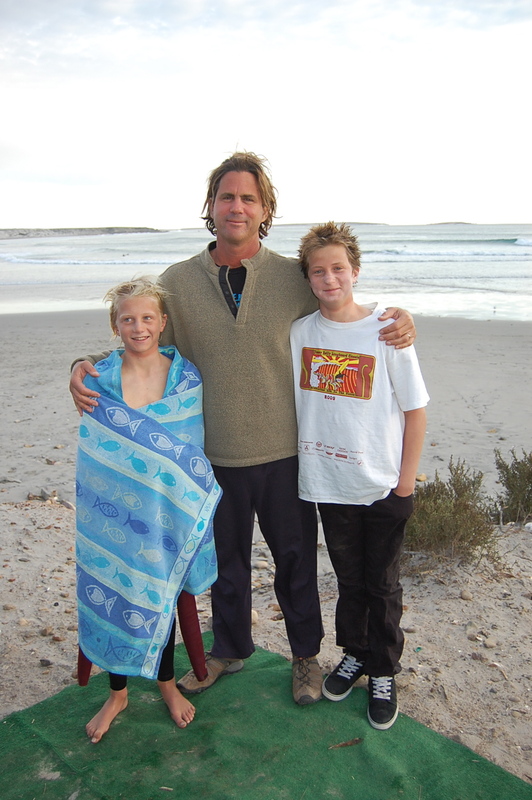 The memories of our adventures—finding perfect, empty waves in Ulladulla, watching Daniel light up as we encountered a mob of kangaroos on a wild beach, surfing Bell’s Beach, hiking around glaciers in New Zealand and watching tiny penguins waddle up a beach on Phillip Island—will be embedded in my memory for the rest of my life. I have never had much money, and I am not sure how to go about making much of it. My life is richer for all the experiences I have had and the family that is my greatest joy. What has kept my stoke alive are those moments of transcendence in which something new brings my family together around shared adventures, experiences and making the world a better place. Thanks to a sabbatical awarded by the California Wellness Foundation, I was able to take a 10-week break from my job as the Executive Director of WiLDCOAST, an international conservation organization, and travel with my family to Australia. 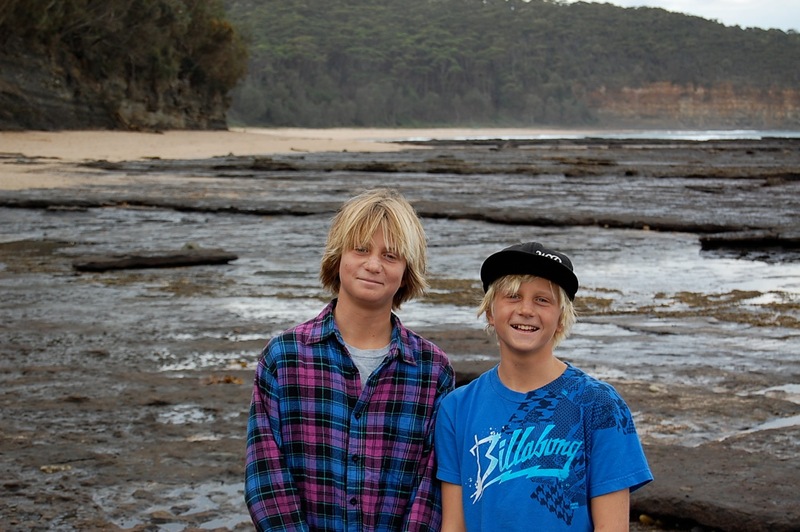 The plan was for my sons, Daniel (11) and Israel (13), and me to spend six weeks surfing and camping in national parks in Australia. Then Emily, my wife of 20 years, would join us for a final week in Australia and three weeks in New Zealand for surfing, hiking and skiing/snowboarding. The boys and I arrived at Sydney Airport in the early morning after a long flight from San Diego. 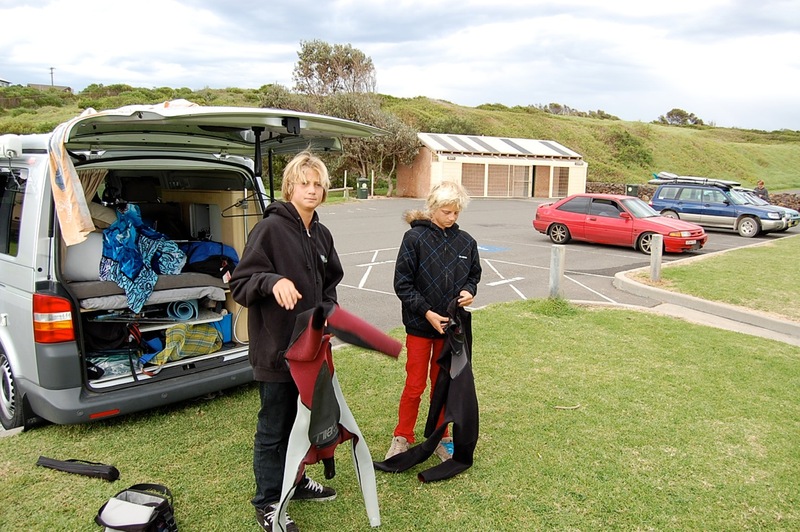 We hailed a taxi van and hauled our five surfboards and canvas duffel bags filled with wetsuits and camping gear to the Kea Campervan rental center on the outskirts of Sydney. There we picked up a 2006 VW diesel pop-top camper van that was to be our home for the next seven weeks. 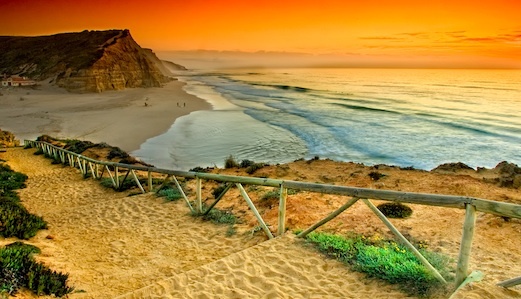 South of Sydney, the Princes Highway skirts the forest of Royal National Park, the world’s second oldest national park, and then descends onto the coast at the village of Stanwell Park. Our first view of the beach was what every surfer dreams of-offshore peaks, minimal crowd and a park with showers and clean restrooms. The forested cliffs of Royal National Park that end at Stanwell Park gave the area a feel of Kauai meets Carmel. 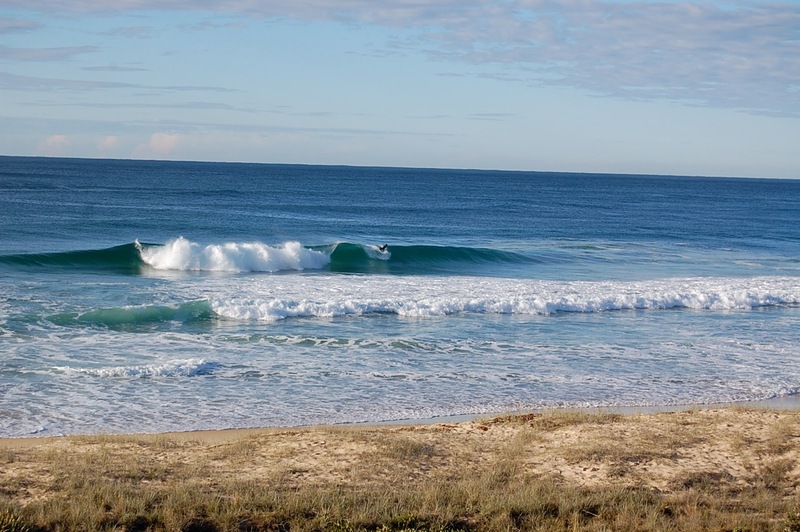 Later that afternoon ,after checking out a surf contest at Sandon Point, we drove into an empty beachside caravan park in the village of Bulli Beach. We cooked up some lamb chops and passed out. A few hours south of Sydney, the landscape changes from bucolic English pastures to Central America-like eucalyptus or “gum tree” rainforests and national parks. 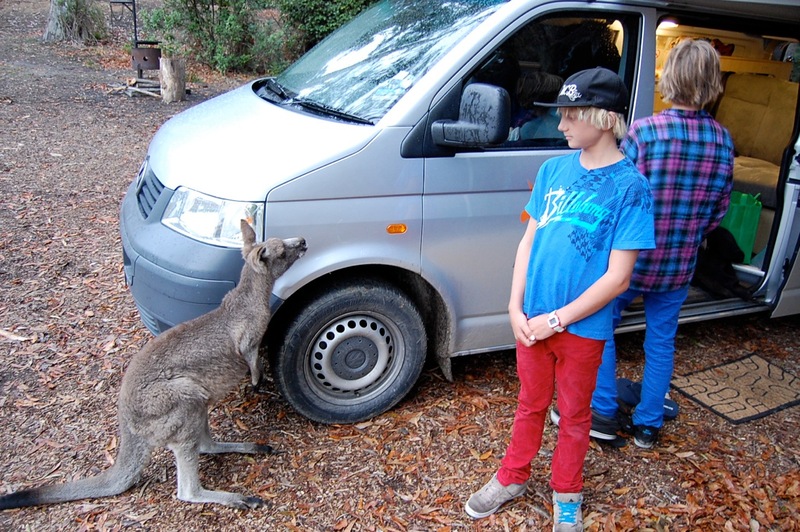 Our destination was Murramarang National Park, known for its population of “bodysurfing” Eastern grey kangaroos. 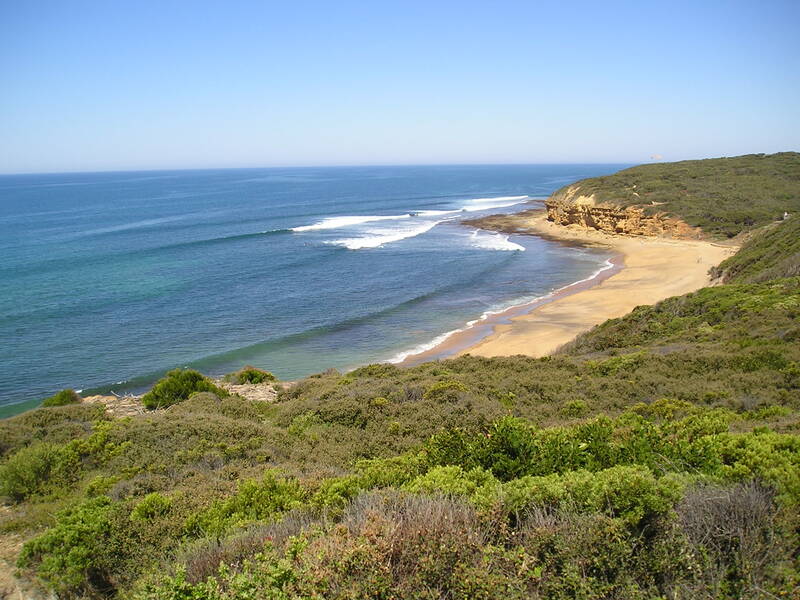 The park is about 45-minutes south of the surf town of Ulladulla. The turnoff to Murramarang from the Princes Highway immediately transported us into the Lost World. The gum forest was thick, dark and moist with heavy underbrush. A road sign warned of kangaroos. We spotted a lyrebird, a cross between a peacock and a turkey. Flocks of parrots flew across the road. We arrived at Pebbly Beach and set off down the tree-covered path to a tree-lined cove. Daniel raced ahead. 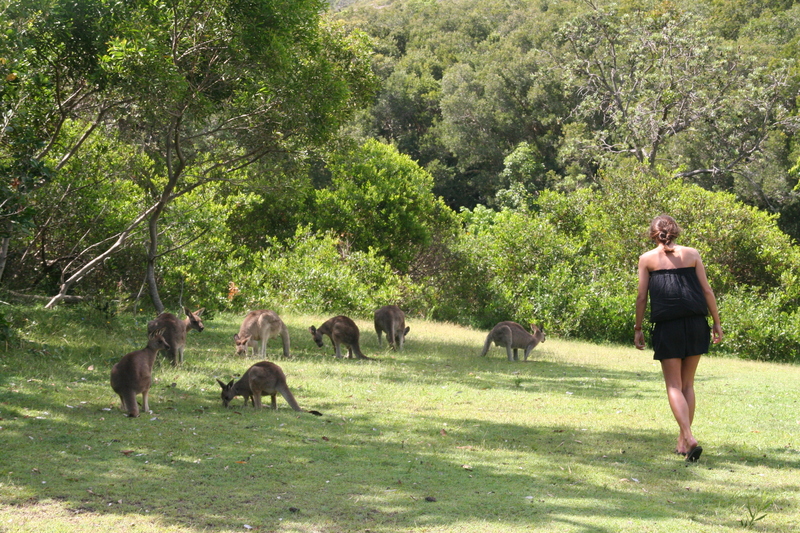 Israel and I arrived at a grassy meadow above the beach and found him surrounded by a mob of kangaroos. Daniel sat motionless, grinning from ear to ear, as a joey approached and almost plopped into his lap. 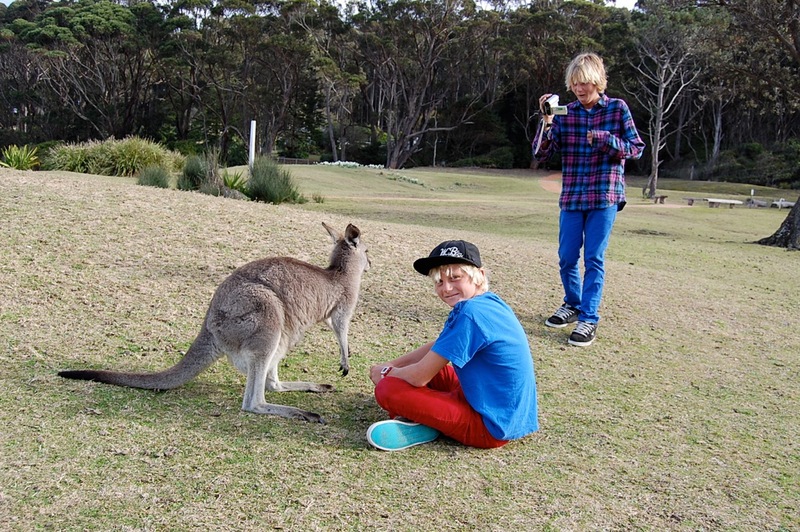 Between surf sessions at a nearby reef, we hung out at our camp, under a huge eucalyptus. 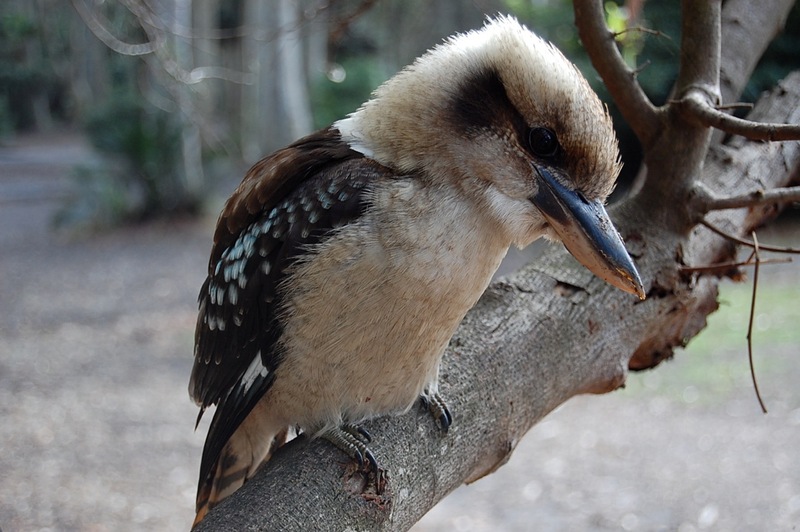 We were surrounded by kangaroos and laughing kookaburras. At night, a pair of brushtail possums, nocturnal marsupials, nosed around our campfire in their nightly hunt for food. 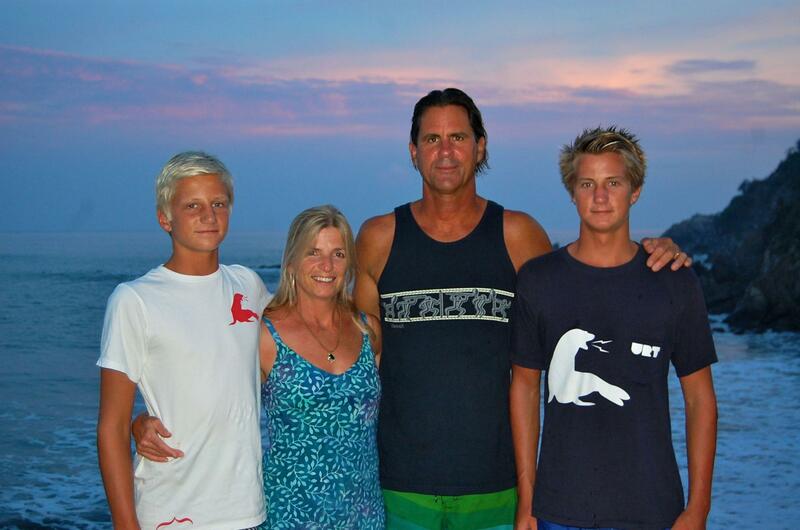 Back in San Diego the lives of my two rambunctious sons revolve around school, surfing, skateboarding and water polo. Living in a cramped VW van presented a unique set of challenges. Because Israel had moved around like a worm in the upper van bed during our first night, he was exiled to a waterproof and sturdy Sierra Designs two-man tent. Daniel and I split the upstairs and downstairs van beds. They boys quickly adapted to life on the road. Each evening after a day of surfing, they slapped steak, lamb chops or hamburgers on the gas-powered campground barbie. They used their extra energy, during downtime in the van, to give me a surfing makeover: They hoped to improve my hopelessly out of date ’70s flow surfing style. 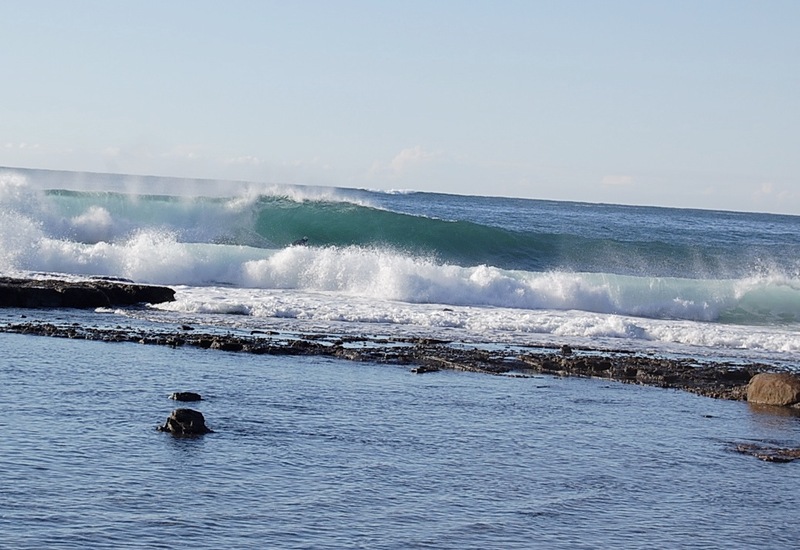 An epic north swell we enjoyed during our stay at Murramarang had dropped off so we packed up the van and headed down the two-lane Princes Highway on our way to Bells Beach. The boys were exhausted from their last surf session. Originally published by San Diego News Network.